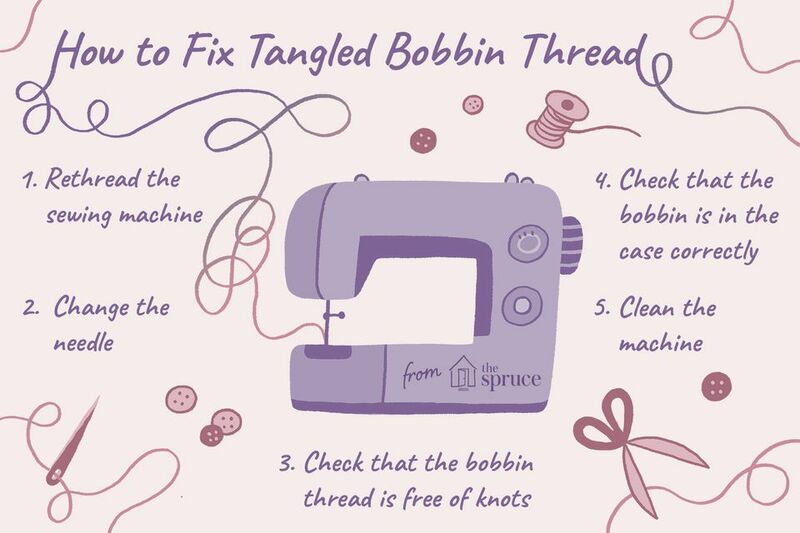 A bird's nest of loopy, tangled bobbin thread on the bottom side of your sewing is one of the most common sewing machine problems that can quickly derail any sewing project you're working on. But don't panic. This problem almost always is an easy-to-fix sewing machine problem. Most people immediately blame the bobbin but most of the time it has nothing to do with the bobbin and you aren't going to need a repair person to fix the problem. If bobbin thread is smoothly and evenly wound on the bobbin, the bobbin is not the culprit. The looping bobbin thread is usually caused by the upper threading of the sewing machine. Re-thread the upper part of the sewing machine making sure the thread is passing through every thread guide on its way to the sewing machine needle. Your sewing machine manual is the best guide on how to thread your particular sewing machine. Always thread the machine with the presser foot up. As long as the presser foot is up, the thread can seat properly. When the presser foot is down, the tension is engaged and it will not allow the thread to seat properly. If the thread is not seated in the tension disks, it cannot engage any tension on the thread and stitch malfunctions are bound to happen. If you're still having, loopy bobbin thread, change the sewing machine needle. Be sure you are using the proper sewing machine needle for your brand of machine, the fabric you are sewing, and the job at hand. If the needle is correct, is it possible you have bent it? The needle is part of the upper threading and is a very inexpensive part to replace. Always remember to let the feed dogs do the work. If you are pulling the fabric to the back of the machine rather than letting the machine feed it through, you are risking bending the sewing machine needle which can lead to all kinds of sewing machine problems. Read more about sewing machine needles. In rare cases, the bobbin can be at fault if it has not been threaded properly. If the thread is not smooth, is uneven, has knots, or is very loose on the bobbin, it has not been threaded correctly. Knowing how to wind a bobbin eliminates this risk. Another thing to check: whether the bobbin is inserted in the bobbin case correctly. Your sewing machine guide is the best resource to check how it should be inserted in the bobbin case. If you do not have the manual for your sewing machine, it is possible to find free sewing machine manuals or replacement manuals online. If your machine uses a bobbin case instead of the newer drop-in bobbins, a bobbin is placed into a removable bobbin case so the thread and the slot form an upside-down "V" shape. The thread is then passed under the metal and out the side of the bobbin case. Still not fixed? How long has it been since you cleaned the machine? Are there wads of lint and thread hiding under or around the bobbin case? Has your upper thread been shredding and possibly leaving pieces in the upper threading path? It's time to clean out the lint and oil the machine if that is what your machine calls for as maintenance which you can find in your sewing machine manual. You have nothing to lose by stopping and cleaning your machine. Sewing Machine Threading Tip for Sucess!